Despite the fact that automation is already very well established in the automotive industry, OEMs, tier one, two and three suppliers alike can still profit from continuing advances in this field. Indeed, by taking full advantage of intelligent solutions designed to maximise efficiency and increase output, companies are able to remain profitable and competitive in face of increasingly challenging market conditions. Likewise, the high degree of repeatable precision this technology offers suppliers enables them to meet the increasingly high standards being asked of them by OEMs. Regardless of where you are in the automotive supply chain, at FANUC we have a range of solutions designed to optimise your processes and increase your productivity. Ask us about automating your production processes now! 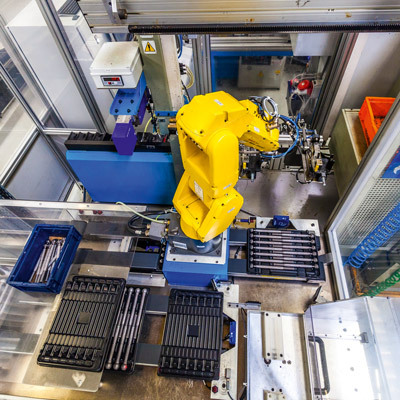 Depalletising, loading and line charging – these and many more front-of-line processes are easy to automate using FANUC’s smart systems and tailor-made solutions. Capable of handling payloads up to 1350 kg, these make any number of scenarios possible. Picking them up from a standard euro pallet, a FANUC R-2000iB/165F robot lifts the heavy castings ­­­for truck cabin mountings onto a viewing table for inspection. A second FANUC R-2000iB then places them in a clamping fixture for drilling and tapping. From there, the first robot takes the parts to a deburring station before placing them back on a euro pallet. Completely integrated into the robot controller, FANUC's high-speed 3D Area Sensor uses vision technology to create instant 3D maps. These enable the robot to indentify and pick loose parts out of a bin and achieve cycle times of 8 to 12 seconds - even if parts are dirty, rusty and oily or, as in the case of bags, exhibit no clearly recognisable features. Set up is easy on PC or the FANUC iPendant Touch. 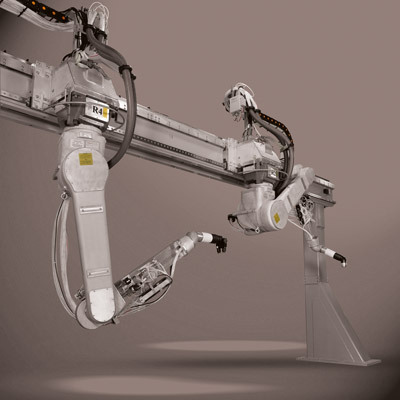 Use FANUC’s unique CNC Power Motion i-A to create highly productive 3 axis linear robot systems. Ready to use and easy to customise, it comes with a complete package of software and is ideally to suited to creating fast, precise, reliable and versatile production cells that deliver short cycle times. The next generation of the world-class R-2000 series are versatile heavyweight lifters. 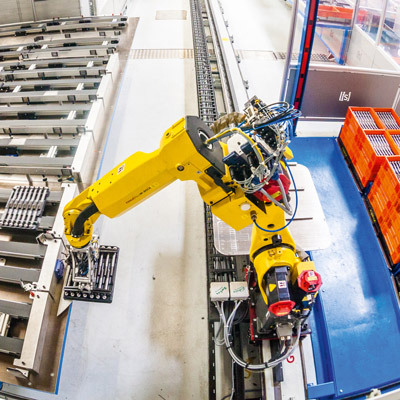 Featuring payloads of up to 210 kg and reaches of up to 2600 mm, these 6 axis industrial robots are now setting the standard across a vast range of industries. 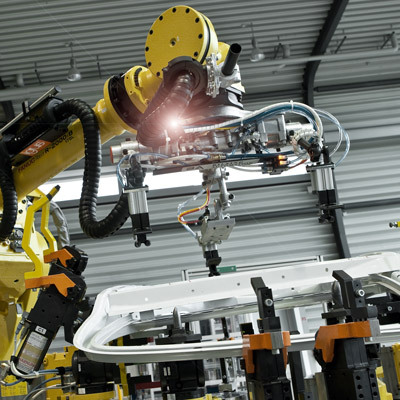 FANUC offers a wide variety of solutions for standardised processes commonly found in the automotive industry. 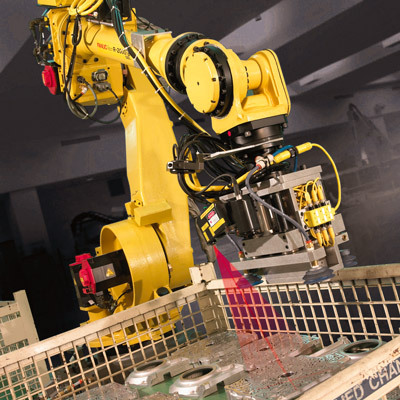 These range from dedicated robots equipped with advanced vision and motion control systems to dedicated solutions for assembling, welding, sorting, inspecting, or painting. Often these solutions are ideally suited to performing repetitive tasks that demand high levels of throughput and which might pose a health risk to humans. In every case FANUC has a solution to improve your cycle time and increase throughput. FANUC provides customised products and interfaces to automate MIG/MAG, MIG pulse, TIG and plasma welding processes. To optimise the welding processes these packages come with their own generators. Delivering improved quality and cycle times, this is a particularly attractive option for small to medium-sized businesses that want to automate in order to reduce costs but do not necessarily want to install robots. "We commissioned another two production lines for riveting, bonding and laser welding. To complete these processes and improve your cycle times, five robots were installed on the larger line and a further three on the smaller one." Using FANUC CNC, drives and robot technology, our partner ANGER combined machining centres with transfer lines to create a setup that produces some 300,000 balance shaft housings for petrol engines per year. Machining the precision workpieces requires a high level of technical sophistication. The machine centres complete the parts in a single machining cycle. As part of the cell, a tending robot feeds the machines with blanks and places the finished parts onto a conveyor at the end of the process. 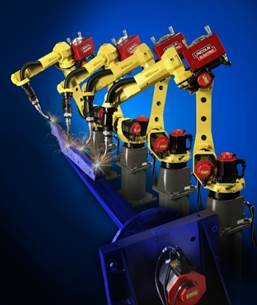 FANUC arc welding robots provide everything you need for the perfect automated welding solution. Purpose built for industries in which arc welding plays a major role, they benefit from a small footprint, extremely fast motors and excellent acceleration. No matter what your needs are, every model in the range has been designed to help you increase weld quality, lower your manufacturing costs and improve the quality and safety of your workplace. Designed for lightweight precision applications, LR Mate is your easy-to-integrate solution for machine tending, handling, assembly, picking, packing and material removal. Speed up your spot welding! 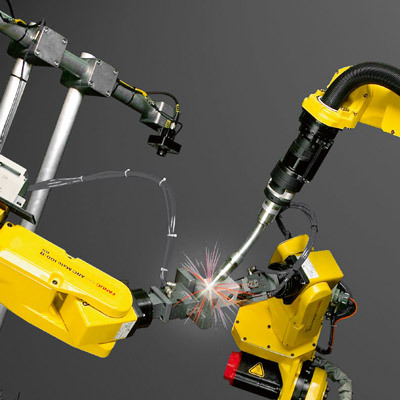 FANUC Learning Vibration Control enables your robot to auto-learn a smooth high-speed motion that speeds up spot welding and drilling applications by up to 15%. 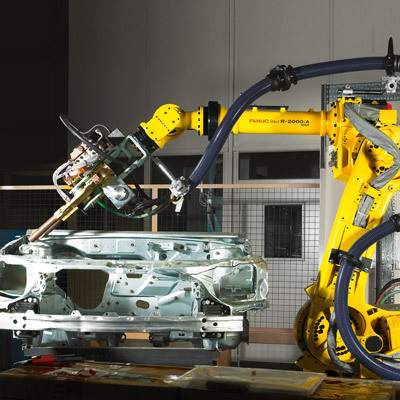 FANUC paint robots are suitable for a wide variety of painting and coating applications, offer easy access, optimal work envelopes and maximised throughput. With some models designed to operate in hazardous environments and a wide range of reaches and handling capacities on offer, whatever your painting or dispensing requirements you can be sure there is a model to meet your needs. 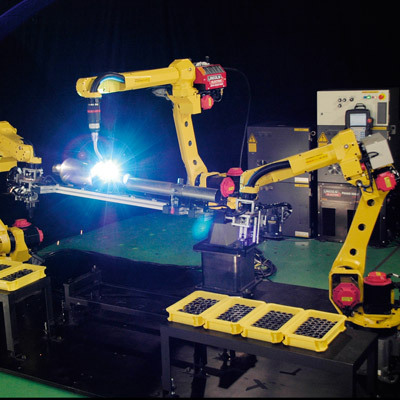 Coordinated motion functionality such as Multi Group Motion supporting up to 8 independent motion groups enables FANUC robots to work together in precise coordination, hold or manipulate workpieces for one another, provide exact work and travel angles, and make best use of the work area. 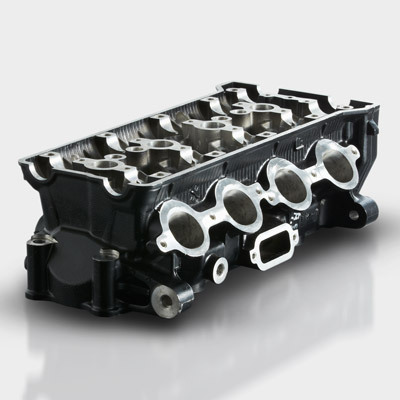 FANUC provides you with high-class CNCs and machines dedicated to the production of automotive components and factory tooling. Whether its drilling, milling, tapping, boring, complex machining, injection moulding or EDM wire cutting, FANUC has a solution to improve your cycle time and increase throughput. Extremely reliably and designed for ultimate accuracy, FANUC products can also be customised to do a vast range of tasks. FANUC CNCs allow you to achieve high production output and the highest quality standards for fast and precise 5 axis milling, turning, grinding or cutting of complex parts such as camshafts, crankshafts or gears, engine turbine blades or housings of all kinds, from consumer to aerospace electronics – or sophisticated parts such as lenses and glasses, medical tools, prostheses, implants or dentures. For the production of injection nozzles or gear wheels, fast ultra-precise hard turning technology using FANUC drives and controls is an economical alternative to circular grinding and achieves accuracies in the micron range. For parts such as wheels, finding a compromise between fast processing and a high-quality surface finish is essential. Designed specifically for high-speed (HSC) and 5 axis machining, FANUC’s 30i-A CNC delivers the best of both worlds. Using AI Contour Control, the control creates intricate shapes, superlative finishes and razor-sharp edges even on very small radii. Using intelligent cutting strategies, the FANUC ROBODRILL achieves the same results as bigger machines in less time. For high-speed cutting or 5 axis cutting it looks up to a 1000 blocks ahead. For the production of automotive parts, wire EDM technology can allow you to dispense with up to 8 steps, including pre-machining, hardening, finishing and ficturing required in traditional machining processes such as milling, drilling or lathing. Automating the end of your production line increases your flexibility, enabling you to react quickly to the trends and challenges involved in providing intelligent and secure good quality packing, storage and logistics. Wrapping, labelling, packing and palletising all involve strenuous and repetitive manual work – something that can easily be done by automated systems for optimised, cost-effective results. Equipped with FANUC’s vision systems iRVision, FANUC pick and pack robots maximise productivity on even the most demanding of operations. Save on software development by using FANUC’s cost-effective queue management tracking software iR PickTool for single robot and multi-robot visual line tracking applications. Designed to be easy to use for beginners and experts alike, this tool enables you to create standard as well as custom configurations. Easy to set up via plug & play, it does not require TP programming and can be operated conveniently using iPendant touch. As well as motors and controls for your grippers, FANUC provides a servo gripper function for palletising difficult and multi-size products. Adjusting the servo tool and switching between products is easy, as is limiting the maximum torque value of the specified motor. Teaching is also simple, as is adjusting the holding force. 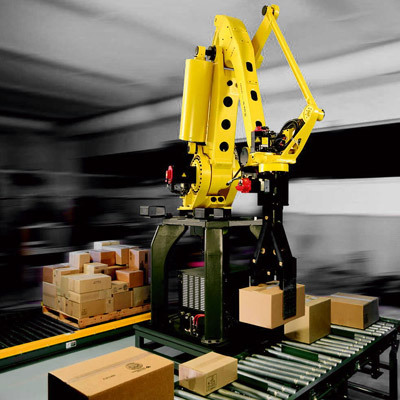 FANUC’s dedicated palletising robots are designed and built to deliver 100% duty and faster cycle times. Featuring adaptable software that does not need to be reprogrammed and capable of handling very large payloads, they provide the ideal solution to any number of complex mixed or standard palletising operations. At FANUC we think creatively - and are experts when it comes to automation solutions. Why not let us inspire you with innovative solutions designed to meet the needs of your industry? No matter what it is, we will show you every conceivable aspect of your automotive production line that can be automated. We know what's possible, but also think the impossible. Get your automation started, now!